Subsequent state governments, under the garb of ‘investor friendly’ approach in the state have been selling agriculture lands to thousands of non Himachalis. Felicitating investment in Power, Tourism and Hydel sectors is the need of the hour they debate. But none have shown any care for those residents who have been living in the state since generations; and still have to seek governmental permission to buy land in the state. These are the ‘Non agriculturist Himachalis’ who mostly are residing in the urban of the state. This population which concerns around 10% finds no respite besides voting all political parties to power time and again. Easing land buying procedures for ‘babus’ could be the top priority of the new government but to no avail for these deserving citizens. A ray of hope these citizens found was in 2016 when the HP High court had directed the state government to make suitable amendments to Section 118 of the HP Tenancy and Land Reforms Act, 1972 read with HP Tenancy and Land Reforms Rules, 1975 in order to facilitate to purchase any land (agricultural and non-agricultural) in the state by the non-agriculturist Himachalis residing in the state for decades prior to the date of commencement of the HP Tenancy and Land Reforms Act, 1972. 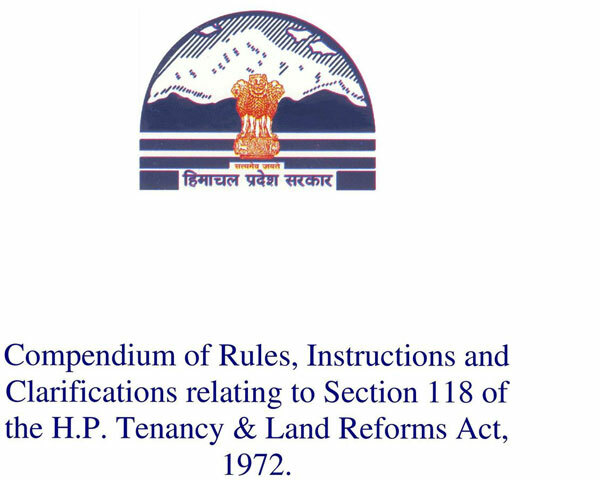 A division bench comprising Justice Rajiv Sharma and Justice Sureshwar Thakur had observed “there is perpetual litigation under Section 118 of the HP Tenancy and Land Reforms Act, 1972. A large population of non-agriculturist Himachalis has been deprived of their right to purchase property in the state without the permission of the state government though they are residing in the Himachal Pradesh for decades together.”However this judgment was later challenged by the then, Congress led state Government in the Supreme Court where the high court order was quashed. Thereafter the issue went low key until now when recently the current state government approved an amendment in the act to facilitate non Himachali government workers. Every time any government quests to relax section 118 of the HP land tenancy and land reform act 1972, it becomes a political ire. So no wonder the move was alleged as ‘dilution of the act’ in a common voice by all and was pulled back by the state government within no time. Yet this action of the state government left behind ruing Non Agriculturist Himachalis. Who thought that when this time the government was aspiring an amendment in the act then they could have also included Non Agriculturist into the list of beneficiaries too? Many such are now left to think, that after bleeding for the land since generations do they have any right or support here? Some Non Agriculturist residents commented “If the state government would have extended this benefit for us, they could have won hearts forever”. But instead they chose to limit the benefit for a selective few. The entire paraphernalia has been out rightly favoring sale of lands to the rich and influential under the ‘investor friendly’ cover but when a Non Agriculturist citizen intends to buy land in the state then shall have to go through a rigorous procedures, rued Non agriculturist citizens. “One has to seek the government permission to do so, and the process is very lengthy. Thereafter too can buy limited land for the required purpose,” they informed. On the other side in name of business investment the rich can grab as much land as they want in the state,” they complained. Some citizens sadly thought that they have been living here since 3 to 4 generations, yet the state is not home for them. As none in the decision makers’ circles is advocating for their cause, they summoned. They thought that even if the high court decision for amendment of the act was challenged in the apex court by the previous government, the new government could have reviewed it, if it had the will to benefit its citizens/voters. The combined demand of Non Agriculturist residents has been about easing of procedures to buy land through an amendment in the Section 118 of the said act. Which they think may not be a very cumbersome decision to be initiated by any of the state governments. Moreover the move also may not entice any retaliation (both from citizens and political parties). As all stakeholders realize that the demand is genuine and should be allowed. They feel that standing by its citizens for a righteous cause should be the ethos of a people government. Though on ground visibly various state governments have been showing limited priority towards this subject, thus humiliating these residents to the core while depriving them of their right. A young supporter of the cause Deepak stated that rising frustration amongst Non agriculturist Himachalis due the repeatedly ignorant approach of authorities is only adding fuel to the pent up fire. Which in days to come might become visible giving way to yet another agitation or a courtroom war, he summoned.